JOHOR BAHRU: THE 17th edition of the Kembara Mahkota Johor (KMJ) will see new elements in the much-awaited event which will include lots of sport activities and free ice cream. KMJ is the brain-child of Sultan of Johor Sultan Ibrahim Sultan Iskandar when he was the crown prince. Since 2001, when it was first launched, KMJ bridged the gap between the ruler and his people. 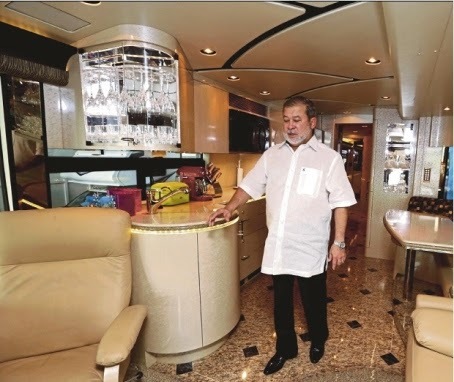 Sultan Ibrahim will be travelling in a left-hand drive, custom-made Prevost Marathon coach during KMJ, from June 21 to 24. The state-of-the-art coach is fitted with a bed, a lounge, water-closets and shower facilities, as well as a kitchen, and entertainment unit. Sultan Ibrahim said he purchased three coaches, so that he and his family could spend their nights in the villages, to be closer to his subjects during KMJ, and participate in the night activities. Sultan Ibrahim said in past KMJs, he was unable to join the people especially at night, which included cooking gotong-royong style. This time around, he will be spending more time with the villagers, especially the old folk whom he fondly refers as Wak. Wak is an endearment used on older men, which means uncle. He said he loved listening to their stories and experiences. The rulers said after KMJ, he will be driving the coach, on Thursdays, to a village in one of the 10 districts, chosen randomly, to perform Friday prayers with his subjects and spend a night at the village. In an exclusive interview with Streets, Sultan Ibrahim said he looked forward to KMJ, which is special to him because during these trips, he gets to meet his subjects without much protocol. "I get to listen to what they are feeling, their needs and suggestions on how things could be better. "If I invite them to visit me, it would be a hassle for them. They may also be uncomfortable. Not wanting to trouble them, I choose to visit them on their own turf. "In olden days, my ancestors went horseback, or rode on elephants to be with the people. I want to emulate them. I want to make sure that my subjects are fine and their welfare taken care off. "Travelling like this, I can ensure that everything is in order, and facilities are there for them." Sultan Ibrahim, who recently lost almost 20kg after embarking on a strict exercise regime and watching his diet, said KMJ's theme this year is "Health". "There is no wealth without health. So, I want to promote a healthy lifestyle. "During this KMJ, there will be lots of sport activities, and medical check-ups. There will also be delicious but healthy food," Sultan Ibrahim said, adding but that there is something special in store for the children. A custom-made Flintstones ice-cream truck will be serving a special blend of ice cream called Johor Soft Ice, at every stop Sultan Ibrahim makes on his KMJ tour. "The ice cream truck, with its cheery jingles, caught my attention when I was in London, England, recently. I saw children faces light up with happiness as they skipped towards the truck to get their ice creams. Looking at the happiness it brought, I decided to get one and bring the joy here to the children of Johor, but the twist here is the ice-creams are free and healthy," he said, when met at Istana Pasir Pelangi here on Thursday.